New research from Northwestern University’s Kellogg School of Management‘s management and organizations department reveals why the Wells Fargo’s and Bernie Madoff’s of the world often find themselves in cycles of deceit and misconduct. You can learn more about the trio’s research here. As part of DePaul’s Sports Management faculty director Andy Clark’s winter quarter sports sponsorship marketing course, Kellstadt Graduate School of Business MBA students collaborated with Arena Partners on “attendance-driving ideas and sponsorship strategies” for the Special Olympics’ 50th Anniversary Celebration set to take place in Chicago this coming July. 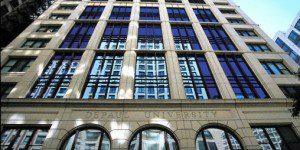 At one point, the class hosted Kellstadt alum, DePaul Board of Trustees member, and Special Olympics of Illinois Board Chair Karen Atwood MBA ’82, who spoke of the potential impact that Kellstadt MBAs can have on their communities. You can find out more about the Special Olympics project here. The Loyola’s Quinlan School of Business Leadership Hub just announced its first annual Solutions Summit; a networking extravaganza designed especially for vice presidents, directors, and managers; supply chain leaders; and family-owned businesses. This year’s inaugural event will host Alberto Ruocco, a Senior Executive Partner at cybersecurity leader Gartner; Reynolds VP of Category Management Nancy Bedwell; and Susan Ramonat, CEO of Spiritus, a Blockchain leader. This year’s event will be held on October 9 at the Schreiber Center on 16 E. Pearson St., Chicago. To register for this year’s Solutions Summit, click here.